You may remember that when I went to Taiwan last year, I raved about Eslite, the famous 24-hour bookstore. It was packed with readers sitting on the floor, in the corners, hidden behind shelves. It was a refreshing change from the smartphone worship that happens around Hong Kong (I'm guilty of this too). 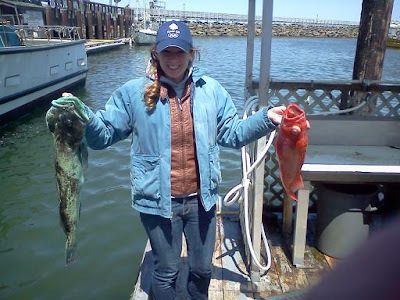 My weekly bookspotting posts started because I was surprised that I could often count the number of readers on my long daily commute on one hand. Taipei was noticeably different. It remains to be seen whether this will have any effect on the reading culture here, but Hong Kong now has it's very own Eslite. 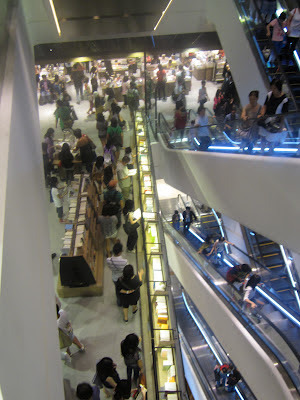 Yesterday, I went to the Hysan Place shopping mall in Causeway Bay to check it out. The bookstore takes up three floors at the top of the mall. It has an eclectic mix of Chinese and English books. The escalators go straight through the middle of the three floors, and you can wander around them in a wide circle as you peruse the books. It was nice to see so many people in the shop on a Thursday afternoon. ...and there were tons of people sitting around and reading. The building itself is lovely, with light wood details and lots of different sections. The layout might make it difficult to find exactly what you need, but it was a great place to browse. 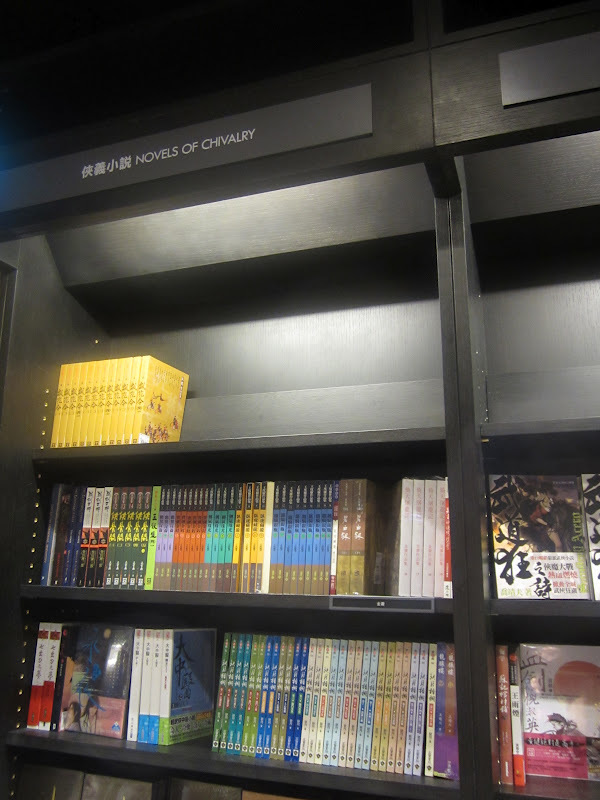 I liked seeing the Chinese and English books mixed together, though it might have been frustrating if I had been looking for something specific. There were some tall windows looking out on the city, and even those were filled with books. 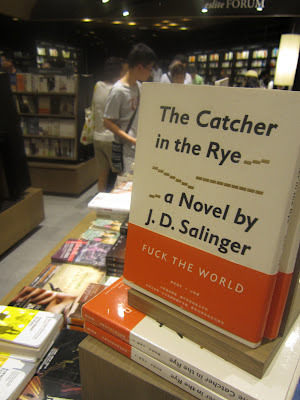 It was fun to see the American Lit section full of Chinese translations. The Forum is an area on the second level where there is space for cultural events, readings and bands. Because there was nothing scheduled that day, it was just full of readers. This also happens to be the spot where the travel narratives are located, which is of course my favorite section. It's also next to the tea room. 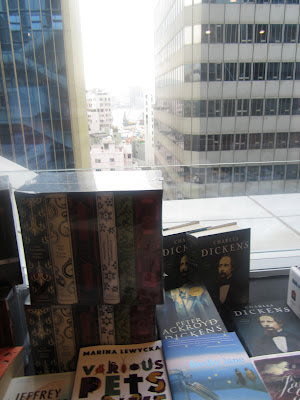 On the literary fiction table nearby, I picked up a copy of Love in the Time of Cholera by Gabriel Garcia Marquez. I bought One Hundred Years of Solitude at Eslite in Taipei, so it seemed fitting. ...which had business books and a number of merchants selling leather goods and miscellaneous jewelry. Completing the tour, there was also a stationery shop with a nice selection of Moleskins, laptop bags and cards. 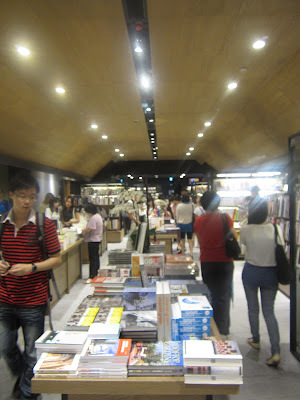 Overall, it was a lovely bookstore and I was happy to see it doing well so far. It'll be open 24 hours on Thursday-Sunday for the next month, so you should pop in whenever you can. 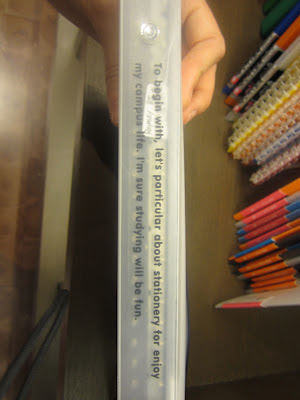 I will leave you with this inspiring word from one of the binders in the shop. A psychologist/aid worker who's been too busy trotting the globe to find love strikes up a long distance relationship with a man she's never met. LOVE AT THE SPEED OF EMAIL is a reflection on the nature of home wrapped up in a long distance love story. The memoir follows the relationship of Lisa, a psychologist who works with aid and development workers around the world, and Mike, a man she meets through email. A lifelong wanderer, Lisa shares her struggles to figure out where home is as she reaches a point in her life where she wants to forge a home with someone. She and Mike get to know each other from afar, hoping that they might one day find home together. Much of their correspondence is included in the book. Hanging over the burgeoning relationship is the constant danger that Lisa and Mike won't actually like each other when they finally meet. They have the added challenge of being in isolating, emotionally draining professions. They are hesitant to pour too much into each other, knowing that they could be creating an ideal person who won't be able to live up to their expectations. However, they understand each other better because they both know what it's like to tackle suffering and injustice, often without being able to see the difference they are making in the world. It is this shared experience and passion that creates such a bond between them from afar. As many of you know, I'm a veteran of a long distance relationship (New York/London - Arizona/Hong Kong - Hong Kong/London). I know what it feels like to wonder whether you'll still get along with someone when you finally live in the same country (it took us 3 1/2 years to manage it). Although this memoir was slow-moving at times, Lisa's approach to the situation shows a balance between practicality, romance and caution that's right on target. Throughout the book, she opens up about her worries, hopes and thoughts about home in a way that will speak to people in long distance relationships as well as expats around the world. I received a complimentary copy of this book from the author. The Kindle version is $9.99. Have you been in a long distance relationship before? How about an internet relationship with someone you hadn't met in person? Would you do it again? 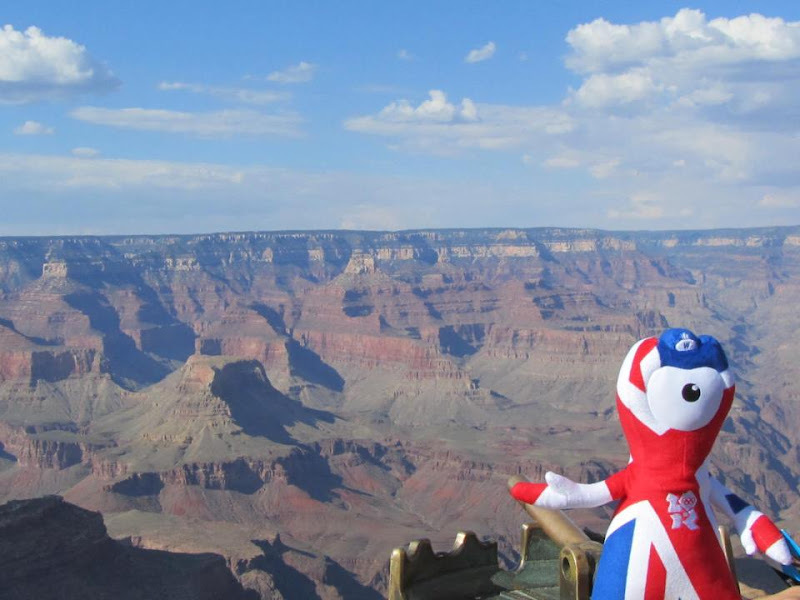 ...and two weeks with my family in Arizona (that's Wenlock the Olympics mascot at the Grand Canyon), I'm back in Hong Kong. Yesterday I returned to work to begin my third year as an English teacher in a local primary school. Jet lag has been waking me up early, so this morning I got to watch the sun rise above the familiar skyscrapers outside my window. Now that the Olympics are over, I'll be getting back to my normal book blogging schedule. If you want a recap of all the guest posts and articles I wrote while promoting my mini travel memoir, they are available at my writing website. On my way from Phoenix to HK via San Francisco, I spotted a satisfying number of books. A woman waiting in the check-in line had a copy of 50 Shades of Grey. There was a man reading The Green Book by Muammar Al Qathafi in First Class. A couple by one of the gates sat reading paperbacks side-by-side. I couldn't see the titles, but he was on chapter 3 and she was on chapter 8. I saw two young men carrying paperbacks by Michael Crichton (one of his books with a red cover) and John Grisham (The Testament). A young woman on one of the planes had a dog-eared copy of The Secret Life of Plants. Finally, I spotted what I'm sure was a Game of Thrones book as I passed a seating area on a moving sidewalk. How was your summer? What did you read? What books did you spot? Last night, I watched the Closing Ceremonies of the London Olympics. The rock concert (mixed with a preview of Rio) marked the end of the first Olympics I have not attended in person since Sydney in 2000. Although it was fun to follow the action on social media, I knew we were never getting the full story. I already miss the Olympics, but my withdrawal started early this year because I couldn't be there in the thick of things. Sadly, the coverage of the Olympics on American TV was very disappointing. (I'm visiting my family at the moment, so I don't know how the HK coverage was.) NBC chose not to show the Opening and Closing Ceremonies on live television even though the Closing took place on a Sunday afternoon our time. I watched the Opening first on a live BBC feed and the commentary was infinitely better than the abbreviated prime time version I watched on NBC later that day. All of the popular Olympics events were squished between long commercial breaks in the evening. There were frequent stops for reality TV-like segments about the athletes and a History Channel documentary about WW2, meaning there was even less time for the actual sports. The result was that we only saw the performances of some of the American athletes and whatever competitors also ended up on the medal stand. This is a dangerous game to play because it creates a subjective picture of the Olympics. One example is that the team gymnastics coverage did not include a bad fall by one of the Russian gymnasts, a fall that gave the US team the gold medal. We saw every match of the star US beach volleyball team of Kerri Walsh Jennings and Misty May-Treanor, only to discover that another US beach volleyball team was also undefeated. We didn't even hear about them until their gold medal match against Misty and Kerri. When I was in China for the Beijing Olympics, it felt important that we were seeing the Games without the bias of either the American or the Chinese media. That was why I felt compelled to write The Olympics Beat about being a spectator at the Games. There are so many filters on our knowledge about what is going on in the world. Now more than ever, it's vital for us to tell our own stories about the things we've witnessed. I'm thankful for my social media friends around the world who helped me experience the full impact of the London Games. By all accounts, London did an excellent job hosting the event. I hear it was an Olympics to remember. However, the American viewers and the athletes were short-changed by NBC's dedication to its advertising revenue. Unfortunately, this network that doesn't understand Olympics viewers has purchased the rights to keep a chokehold on Olympics coverage until 2020. With any luck, I'll be watching Rio 2016 in Asia, or in person. It's been a little quiet on A Kindle in Hong Kong lately because I'm on holiday in the US. I spent a few weeks at my grandparents' farm on the Oregon coast (above), and now I'm at home with my family in Gilbert, Arizona. Most of my time has been spent hanging out with my siblings and watching the London Olympics on TV with my dad and fiance. This morning, my mom woke me up early to tell me that my e-book The Olympics Beat: A Spectator's Memoir of Beijing is on NBC local news for Phoenix and The East Valley Tribune. The article also appears in the print version of The East Valley Tribune which showed up in our driveway this morning! What are you up to this summer? What's your favorite Olympic sport to watch?